All our kittens are microchipped, vaccinated, wormed, vet-checked, litter-trained and registered with pedigree papers from ANCATS. As PetPlan preferred breeders, our kittens go to their new homes covered by 6 weeks free pet insurance. Pet kittens are desexed and priced between $1200-$2,500, depending upon their individual colours and markings. A non-refundable deposit of $500 is required to secure your kitten. We’re happy to take deposits on kittens at any age, but they won’t be ready to go home with you until they’re 12 weeks old. Entire kittens and cats are only available to approved applicants. 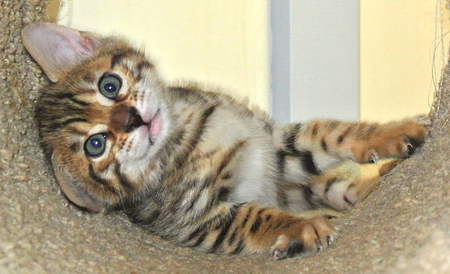 Please contact us if you’re interested in breeding Bengals.